What we eat affects our bodies and our personal well-being. It also effects the well-being of the communities where the food is produced and sold. By buying locally, eating lower on the food chain, and being conscious of food waste, can change your health and the health of your community for the better. Simple dietary choices can support your local economy, reduce your carbon footprint, and greatly reduce the amount of waste you produce. 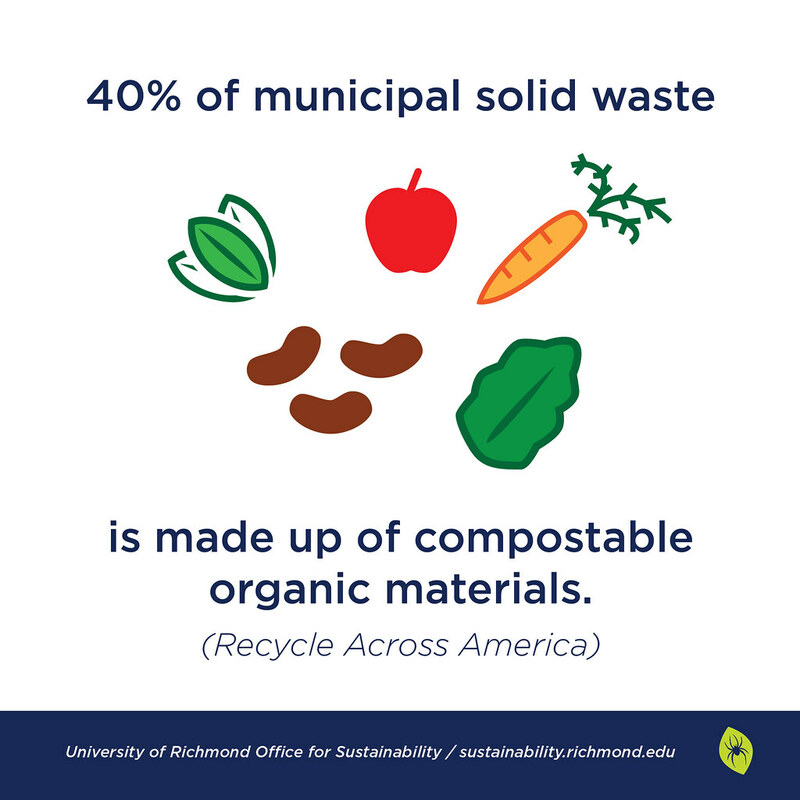 University of Richmond Dining Services continues to be a strong proponent of sustainability on campus. Read more about sustainability in campus dining here. Test your knowledge, learn more, or get one step closer to joining URSA with our dining quiz. Read more below about how you can make more sustainable choices when eating on campus, off campus, and when cooking for yourself. Learn more on the Dining website. When food must be transported because it does not grow in your region, or is not in season where you are, it has a huge environmental impact. 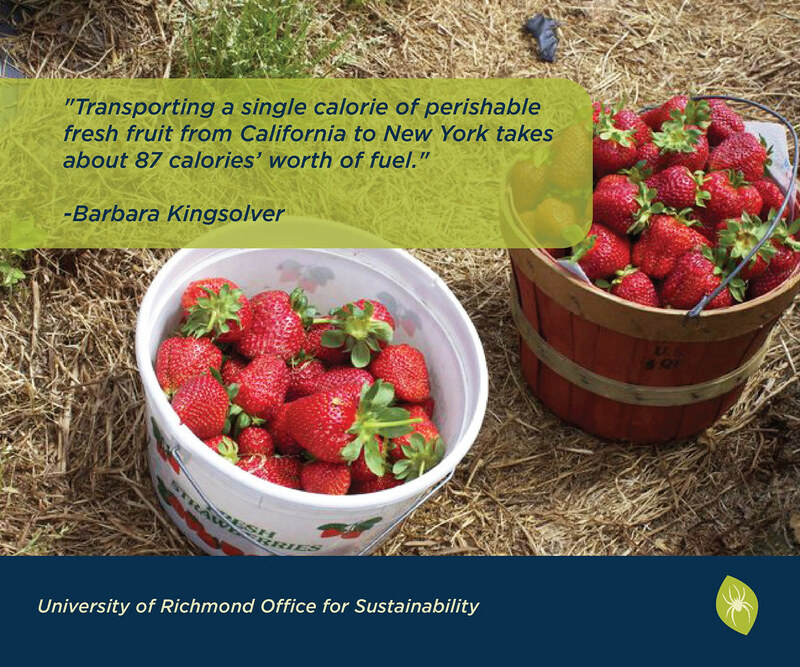 Transporting one calorie of perishable fresh fruit from California to New York takes about 87 calories of fuel (Barbara Kingsolver). When grocery shopping or eating at a restaurant, try to pick dishes that use seasonal produce. When you are cooking for yourself, try to choose locally grown fruits and vegetables. Buying from local farmers and groceries avoids the pollution that would result from transporting food long distances, supports local businesses, and strengthens your local economy. You can view a list of seasonal produce in Virginia here. There are number of local groceries stores and farmers markets close to campus, explore a list here. Pesticides are dangerous to human health and the environment, and genetic modification can have a negative impact on environmental stability. You can find a list of fruits abd vegetables that usually contain the most pesticides here, especially consider buying those items organic. Many species are severely over-fished and we are consuming seafood faster than fish, mollusk, and crustacean populations can replenish themselves. Look here to learn about which types of seafood are good choices and which shoud be avoided. When shopping or eating on campus, choose dishes that feature seafood that is not being over-harvested and ask where your seafood is coming from. Reducing the amount of meat you eat is one of the easiest ways to reduce your carbon footprint. If the entire U.S. did not eat meat or cheese for one day a week, it would be the equivalent of taking 7.6 million cars off the road, according to the Earth Day Network. Not all meats have the same environmental footprint. Raising cattle and sheep negatively impacts the environment to a greater extent than raising chicken or turkeys. Consider choosing one day or meal a week to eat vegetarian and commit to reducing your environmental impact through your dietary choices. -Go trayless in the dining hall. Approximately 137 pounds of food are kept out of the landfill every trayless day. 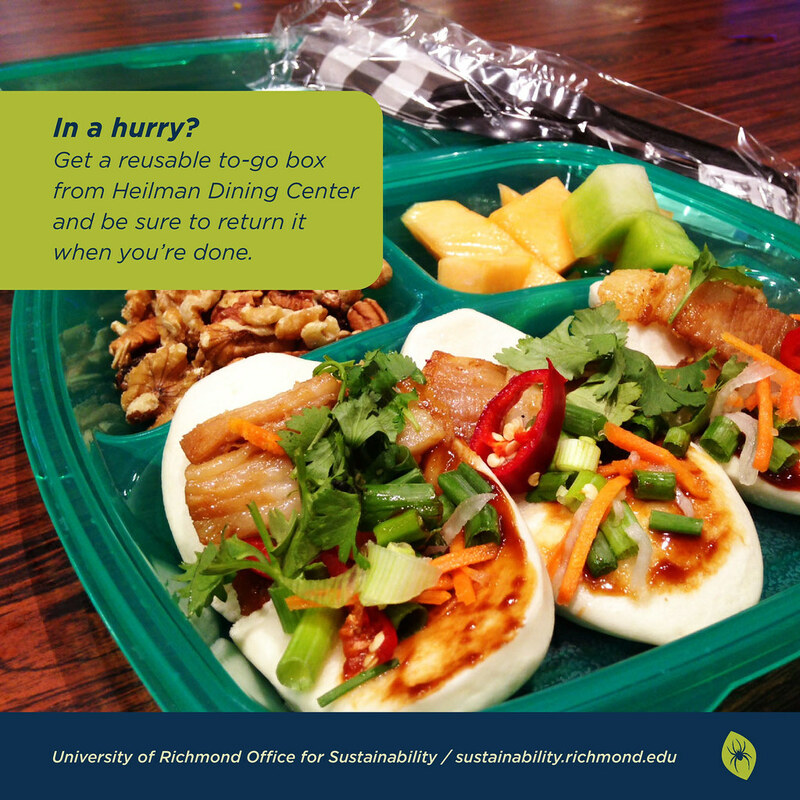 Skip the tray and help us reduce food waste on campus! -Start out with just one plate in the dining hall, you can always go back for seconds. This helps prevent food waste. -Take advantage of the reusable to-go boxes in Heilman Dining Center, and remember to return them to be washed when you're done. -Bring a reusable bottle or thermos with you to avoid using disposable bottles and cups. -Choose local restaurants and restaurants that focus on local produce. You can find Richmond restaurants that utilize locally sourced ingredients here. -Bring your own to-go container for leftovers to avoid using a disposable container and reduce waste. -Choose tap water rather than bottled water. -Buy local, seasonal, and organic, as mentioned above. -Buy in bulk. This is often more cost-effective. Talk with your family or roommates aboutwhat you use the most and work out a plan to buy in larger, cheaper quantities. -Meal plan before you shop to reduce food waste in your household. -Bring reusable bags when shopping. -Where possible, cut out processed food. This reduces the resources used to produce and package food. -Utilize reusable cups, utensils, plates, bowls, and napkins. -Run your dishwasher only when it is full to save water and electricity.